Scoliosis & Bulging disc. A Firm Latex Foam Mattress. Home → Pain → Back Pain → Scoliosis & Bulging disc. A Firm Latex Foam Mattress. Help! We purchased a Simmons Latex Natural Care Plush mattress a few years ago and my back is killing me. I recently had an MRI to find out what the problem is and I have mild disc bulging and I have had mild scoliosis since I was a child. Recently we went on vacation and slept on a Sealy Posturepedic Encore 720 and my pain was significantly reduced.Is it in my head or is the Sealy a firmer mattress than the one we sleep on at home? Thanks for any recommendations, Pete! It's not in your head. The Sealy mattress is firmer and exactly what your back needs.However, you aren't likely to need a new mattress. You have a firm mattress right there in front of you. The first thing you need to do is flip your mattress over. You'll find the underside to be much firmer. Even though it is sold as a one-sided mattress, the underside it totally usable. 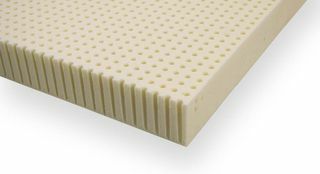 If you find the flip side of your mattress to be too firm, all you need do is a dd a 2" soft Talalay Latex foam mattress topper. …and you will have all the support and comfort you'll need & want.